We left Frikes in the morning and enjoyed a beam reach across to the straits that separates Lefkas and Meganisi, before the wind completely died. As Rod said, the channel is one of the loveliest straits in the Ionians and it was great motoring through it a second time. It’s quite amazing to pop through the other side into this wonderful protected bay with yachts everywhere. There was some sort of race going on as well as all the cruising boats. 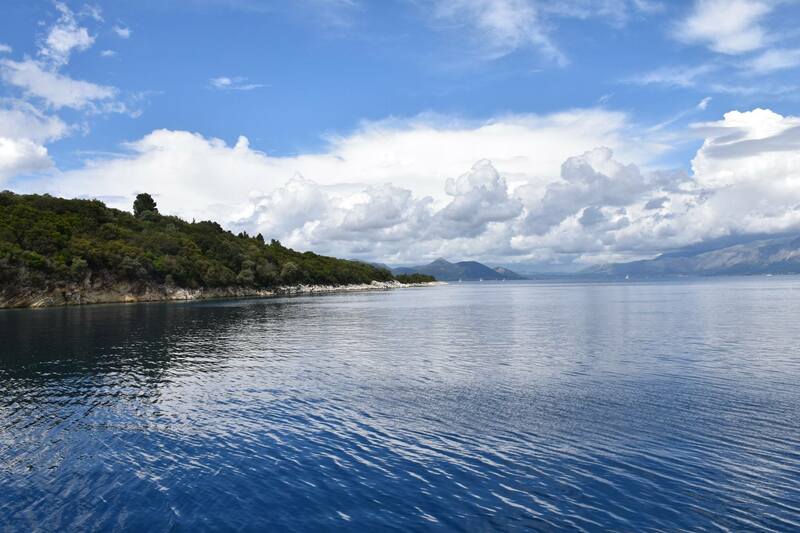 We headed for the private Skorpio Island, which was owned by Aristotle Onassis for a sticky beak. You can’t land on the island, it’s still privately owned but it was still interesting circumnavigating it. Then it was on to Inkblot Island…Meganisi. On the charts it looked fascinating with bays and inlets littered along its northern coast. We picked out Port Atheni from Rod and headed there. It wasn’t a port in any sense of the word…just a nice indented bay. I must admit that I was a little disappointed in Meganisi. It looked really cool on the 2 dimensional chart, but I like Ithaca a lot better. Mind you, the water was lovely and clear and the little bays interesting. It’s just that I was expecting a bit more. We anchored in the head of the bay amongst 4 other boats in about 7m of water. Still too cold for a swim. So we dingied in and had a half litre of wine at the one and only open restaurant. Then back to the boat for a movie and a morning get away. This entry was posted in Greece and tagged Aristotle Onassis, Meganisi, Skorpio Island by stull61. Bookmark the permalink.